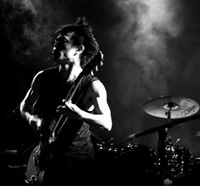 Ganga Zumba is the new group of Kazufumi Miyazawa one of Japan's leading musicians. 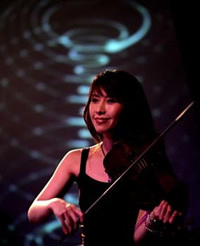 Ganga Zumba comprises several members who formed part of Miyazawa's incredible solo projects. These include from Brazilian the amazing pandeiro percussionist Marcos Suzano, keyboardist Fernando Moura, from Cuba Luis Valle on trumpet and from Japan, Hiroshi Takano on guitar, drummer (also with Orquesta de la Luz) Genta and Reiko Tsuchiya on violin and Chiinese erhu. Kazufumi Miyazawa, formed the rock group, the Boom, at the end of the 80s who in 1993 released an Okinawan influenced single Shima Uta, (island songs) which went on to sell over a million and a half copies, and won the Japanese equivalent of a Grammy that year. The song has since become a hit throughout Asia and in Argentina when it was used as the country's World Cup 2002 theme song. Over the following years, Miyazawa expanded his horizons, travelling to and absorbing music from Indonesia, Jamaica, Cuba and particularly Brazil. Eventually he decided to divide his creativity between a more orthodox rock group and experimentation with various solo projects. He has recorded four solo albums in London, Brazil, New York, Buenos Aires, Tokyo and other locations with a spectacular cast of guest musicians and producers including Carlinhos Brown, Arto Lindsay, Hugh Padgham. In 2004, Far Side Music released Tokyo Story, a compilation of these four albums. 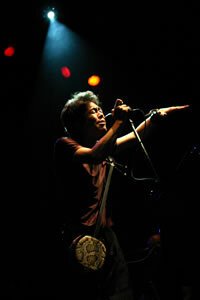 In 2005 Miyazawa toured Europe including London, Paris, Poland and Russia.